August 15, 2017, New Delhi: As India turns 70 this Independence Day, every Indian would be proud of the achievement of the country. Community engagement platform LocalCircles conducted a set of polls to gauge the mood of the citizens. To document their perception about the country over the next 5 years. More than 25,000 citizens from across India answered the questions and gave some great insights. 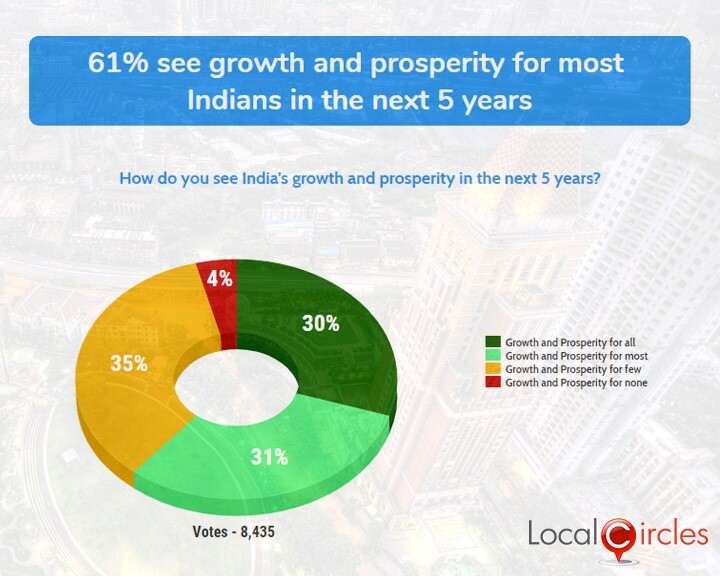 Around 61 % citizens see growth and prosperity for most Indian over the next five years. They feel optimistic that India will be able to leverage its demographic dividend and create employment and entrepreneurship opportunities for young Indians. Around 34 % citizens have expressed concern on the social stability front i.e. the ability for people to live together peacefully and in harmony. A high 75% expect India’s global clout to further improve as India approaches 75 years of independence in 2022. Approximately 66% feel India will be able to improve its governance delivery during this period as it implements Aadhaar based governance and adopts participative governance models. The first poll asked how they saw India’s growth and prosperity in the next 5 years. In response, 30% said they see growth and prosperity for all, 31% said they see it for most, 35% said they see it for few and 4% said they see growth and prosperity for none. India is the largest democracy of the world. If India’s aim is to become a developed country in the next decade, its economic, social and political performance will need vast improvement. Citizens said that for India to grow and prosper many areas will need an improved performance including many public enterprises, infrastructure development, government school education etc. 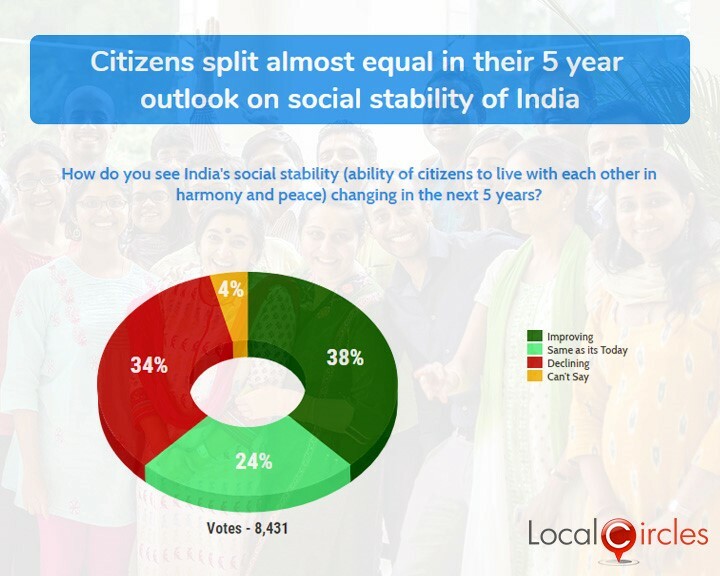 In the second poll, citizens were asked how do they see India’s social stability (ability of citizens to live with each other in harmony and peace) changing in the next 5 years. 38% replied saying they see it improving, but 34% said they see it declining. 24% see it being same as today and 3% were not sure about it. For India to be a world leader communal and social harmony would play a very important role. Cases of using religious sentiments to create vote banks are not unheard of and such instances will need to be completely eradicated. In various structured discussions, citizens suggested that the police must have close association and connectivity with the community and strict laws should be formulated to handle violent protests. They also said that caught vandals should be strictly dealt with and an example should be made on what is not acceptable and politicians found guilty of flaring up of communal tensions should be severely punished. 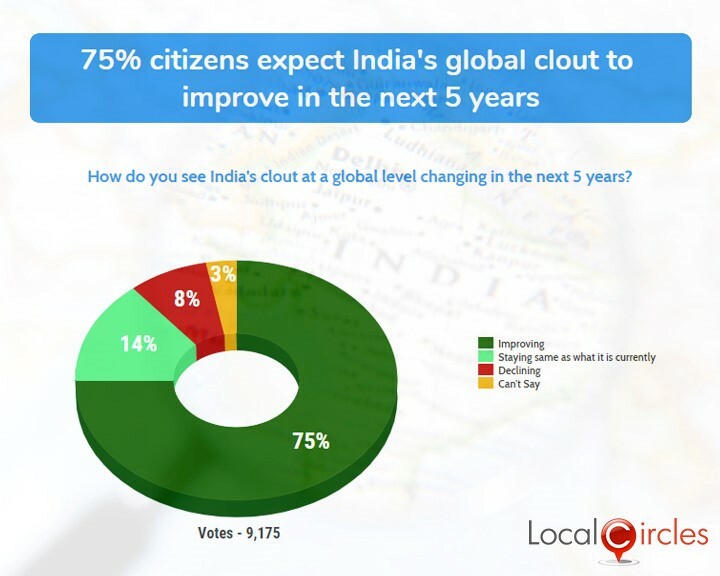 The third question asked the citizens how they felt India’s clout would change at a global level in the next 5 years. In response, a majority of 75% citizens said that they see it improving, 14% said it will stay the same and 8% see it declining. Several new programmes like Make in India, Startup India, Swachh Bharat, Skill India, Smart Cities, implementation of major tax reform via GST etc. are attracting the attention of leading nations and corporates. Citizens said that India should garner more global support for India’s fight against terrorism and strengthen India’s image with other nations. The fourth question asked how India will leverage its huge demographic dividend i.e. young population in the next 5 years. Around 31% said India will create a lot of new employment and entrepreneurs. Around 35% said India will be able to create only some employment opportunities, but many entrepreneurs. Only 29% said India will be unable to create new employment or entrepreneurs and 5% were not sure about what would happen. India has more than 50% of its population below the age of 25 and more than 65% below the age of 35. It is expected that, in 2020, the average age of an Indian will be 29 years, compared to 37 for China and 48 for Japan. Citizens said the government will need to take the right steps for the skill development of the youngsters for making them job ready and each state should set up skill development schools. They also suggested that the existing ITIs and polytechnics be modernized and the young populations should be guided towards the right direction. At the same time, entrepreneurship will have to be given a boost and sops will have to be announced for SMEs fighting against cheap imports from neighbouring countries. Many citizens also feel that corruption, a major barrier for SMEs to establish and do business must be addressed in mission mode by central and state governments by enabling local ecosystems that focus on improving transparency and accountability. 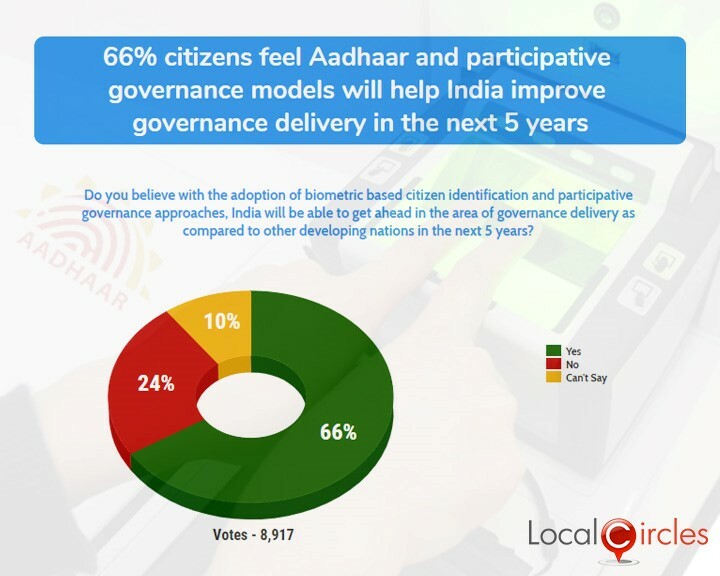 The fifth question asked that with the adoption of biometric based citizen identification and participative governance improve governance in the next five years. Will India be able to get ahead in the area of governance delivery as compared to other developing nations in the next 5 years. Majority that is 66% replied in an affirmative while 24% replied in a negative. 10% were unsure about it. Aadhaar is expected to become the basis of most of one’s business and official transactions in India. Over a billion citizens have already enrolled under Aadhaar making it the world’s largest biometric database. The government has in the recent past asked the citizens to link their Aadhaar card with their bank account, PAN card, Income tax returns, EPF, passport and many more. It will soon be India’s version of the American ‘social security number’ plus a lot more because of the biometric. It might become the ‘only card’ in the future replacing all other like voter id, PAN card etc. making it easier for the government to pass on the benefits to the citizens as well as track transactions. Citizens have also outlined the new model of participative governance used by some central government ministries as a big positive step. Ministries like Consumer Affairs and Departments like FSSAI are now listening to citizens as they formulate policy. This unique practice according to citizens should be followed by all central, state and local government departments such that citizens are made a key stakeholder in the governance and policy process.